The club was founded in the summer of 1996. The first Friday of September 1996 we had our first meeting. September 4, 1996 we became Incorporated/50 members. The founders realized that Thurman was the missing link between the Prospect Mountain trails and Speculator. They knew that there use to be trails on private, state and county lands. 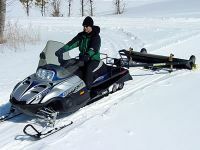 If they could find them - and get permission to use them - they may be able to connect and not have to trailers their sleds to ride. and 5 groomers operating on 118 miles of scenic Adirondack Mountain trail. 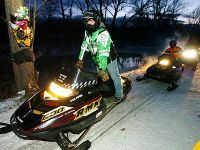 Some of the members who started the first snowmobile club in Thurman The Schroon Hudson Ridge Runners helped point the guys in the right directions. This made it a lot easier to find some of the old trails. There was still a lot of old trail markers on trees. They spent every waking moment looking for trails, looking at tax maps getting names & addresses, going door to door to get permission from private landowners to clear trails and cross private land. Ninety percent of the landowners they talked to let us through. There is not enough we can say or do to thank the private landowners for their generosity. Without their support there would be know trail system. Next the guys went door to door asking everyone they knew who had a sled to make a donation so that they could start the club, become incorporated and buy trail insurance. There was no grant money to help us out the first year. With a great deal of help from Palmer Brother's & Northern Warren trails Blazers the Thurman Connections was now a dream come true for some real hard working guys.